We all like cakes that are beautifully iced for special celebrations throughout the year. Many of us enjoy decorating them for our friends and family with tinted buttercream, piped with exact proportions and sometimes we even add a bit of whimsy to make them unique. 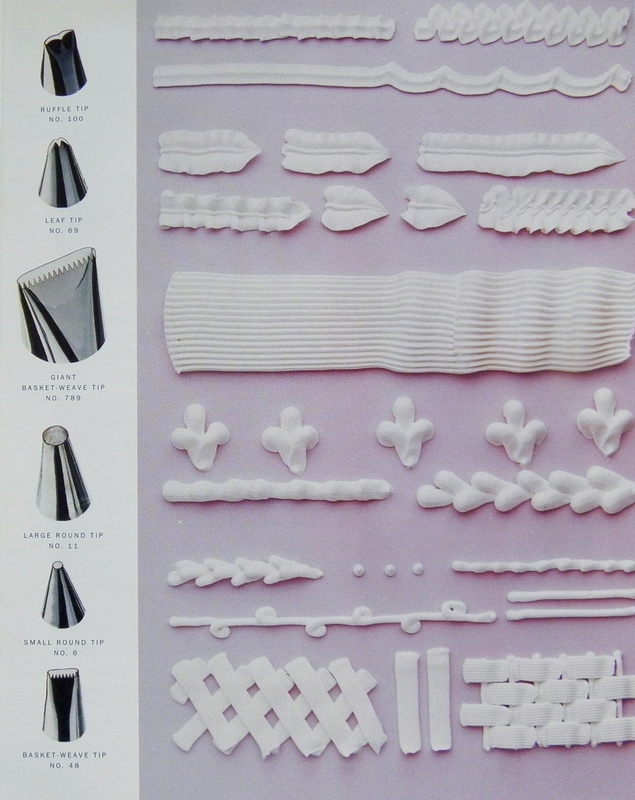 Many years ago when Martha by Mail was available, the product developers provided us with a wonderful cake decorating kit which had every tool needed to create lovely cakes. With this kit came a small decorating booklet. The booklet is now a collector's item and I'd like to share it with you if you haven't seen it before. The cakes, tips and decorating instructions found here were taken from previous Martha Stewart Living publications and were collected in a very informative 12 page booklet. 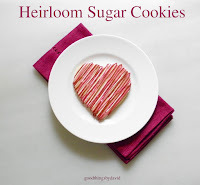 A few classic recipes from marthastewart.com were included, such as the ever-popular royal icing and buttercream recipes, plus a typical yellow cake recipe. I did not include them in this post, but you're more than welcome to visit the website for those and many others. Enjoy creating beautiful cakes for your loved ones. Nothing conveys a sense of celebration more than a well-decorated cake. But too many people are afraid of trying to sculpt leaves, stars or flowers in buttercream. Now, with this kit from Martha by Mail, you'll find icing easy and fun. Ateco, the company that makes the thirty two tips, the pastry bags, and other tools, is renowned in its field. This booklet will show you which tips suit which job, and how to use them. Begin with the simpler cakes, then move on to the more complicated ones. In no time at all you'll be improvising your own designs. "Icing takes some practice, of course," says Martha Stewart, "but it doesn't have to be perfect. 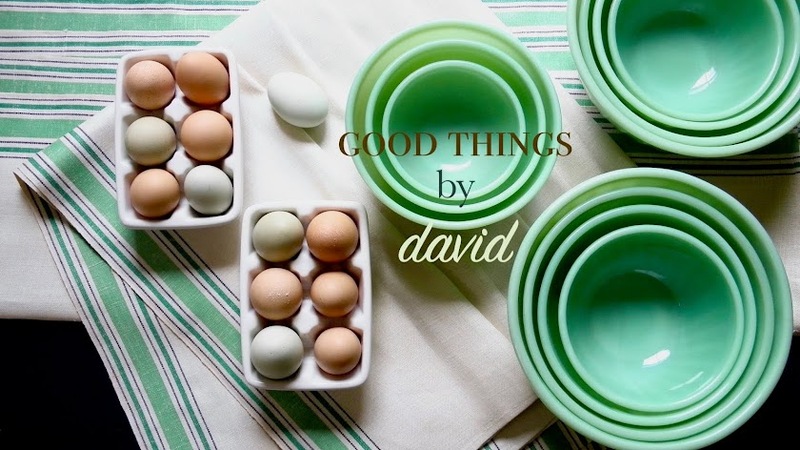 If anything, a little wiggle here and there makes a cake look more personable." Decorating tips are identified by a number and family- such as Star or Leaf- that they belong to. The decorating tips in your kit are made by Ateco (other companies may use different numbers). Use round tips for lettering, drawing and dots. Star tips make rosettes, zigzags, shells, puffs, and rope borders. Basket-weave tips produce smooth and ribbed stripes. Ruffle tips make ribbons, fluted borders, and rows of hearts. Leaf tips create leaves with a center vein. Petal tips pipe petals, swags, and ruffle borders. See "Creating the Perfect Base" for how to prepare a cake. For the yellow-green borders, hold Small Round tip No. 5 at a 45 degree angle to top edge of cake. Squeeze until a small mound appears, then release while drawing tip down and right to make a teardrop. Repeat, drawing upward, overlapping tail end of previous mark. Repeat both steps until border is completed. For petals, use Curved Petal tip No. 69. At center of cake, hold wider end at 90 degree angle with curve pointing away from you. At the tip of the petal, stop squeezing while drawing petal out to a point. Dot center with Round tip No. 2. Coat a square cake as smoothly as possible with frosting. Dot beaded edges in a contrasting shade using Round tip No. 2 or 3. Coat a cake with chocolate frosting Mark surface into four quadrants. Hold Giant Open Star tip No. 864 at a 90 degree angle to cake. Pull up while gently squeezing, then release halfway into each peak, drawing up until icing forms a point. Fill each quadrant with one of four shades of icing, starting with a row of peaks along one radius. Complete rest of quadrant with neat rows. Pipe a white shell zigzag border along top and bottom edge of cake using Open Star tip No 18. Hold bag at a 45-degree angle to side of cake. Apply even pressure as you move tip up and away form you to the right, then release while pulling toward you, also to the right, letting each shell slightly overlap previous one. With a No. 70 Leaf tip, pipe leaves in green icing on top of shell border. Position tip on inside edge of border. Squeeze and hold tip in place, then relax and pull toward you over border, curving slightly to the right as you draw leaf to a point. Use Small Round tip No. 5 to pipe a small dot in a lighter shade of green on upper left side of each leaf. Ice the cake in yellow, then use a sieve to dust with confectioners' sugar. Position Giant Petal tip No. 180 against side of cake, with wider end facing down and narrow end angled slightly away from cake. Begin with top band. In one continuous motion and with even pressure, squeeze bag while rotating turntable full circle. Each successive band should overlap slightly. The same tip makes the rose: use a rose nail with a square of wax paper. Dab a bit of icing on nail to secure paper. Using the same tip, make a mound of icing as a base. Hold tip against the mound as you did for the cake's sides. Applying even pressure on bag, twirl rose nail to rotate three times. Giant Leaf tip No. 115 creates a dramatic ruffle band around cake's top. Apply even pressure on the bag as you zigzag in a left-right motion all the way around. Along bottom edge, pipe a small pearl dot border using Small Round tip No. 2. Write monogram with Small Round tip No. 3. Cover cake with pale green icing and dust sides with confectioners' sugar, tilting cake slightly while holding it in your hand. Use Straight Petal tip No. 104 to pipe ruffled peaks in white buttercream. Begin at center, holding icing bag at a 90-degree angle. To make each snow peak, apply even pressure while moving tip vertically in a zigzag motion. Stop squeezing halfway into each one, drawing the icing upward. Place peaks as close together as possible to give an overall effect of snow covering a mountaintop. The flower and spiral on these bite-size cakes were drawn with a No. 2 Small Round tip. The same tip was used to create circle of dots. Leaf tip No. 65 pipes a thin shell border. Against a base of pink icing, pipe pale violet columns using a No. 895 Large Basket-Weave tip. Position tip with grooved edge facing down. Hold bag at a 45-degree angle to sides, piping each column from bottom to top edge. Use Closed Star No. 35 to pipe a rosette at the top of each column: hold bag at a 90 degree angle, squeeze up in a circular motion, and release to form a point. At the base of each column, squeeze star tip while holding the bag at a 45-degree angle; release quickly. At top, perch a dark pink dot on each rosette with Small Round tip No. 2. Place the chilled and filled cake, bottom up, on a platter or a cardboard round lined with strips of waxed paper (easy to remove after icing); place on a turntable. Smooth on a base layer of buttercream with an icing spatula to seal in crumbs. Rechill the cake until icing is hard, about 15 minutes; coat the sides with a quarter inch of buttercream. Hold a spatula parallel to the sides of the cake, with the blade slightly angled toward you. Apply pressure, rotating turntable with the other hand. To smooth down icing build-up on the cake's top edge, hold spatula edge parallel to top of cake, turning the stand and pushing excess into center of cake. Do a short section at a time. To smooth the top of the cake, first add more icing, if needed. Then holding spatula flat on top of cake, angle the right edge slightly inward with gentle pressure while turning cake counterclockwise with the other hand. Apply even pressure as you turn stand full circle. icing to be used for decorating should not be chilled but allowed to reach room temperature; leaves in particular need icing to be quite warm to achieve a good shape. 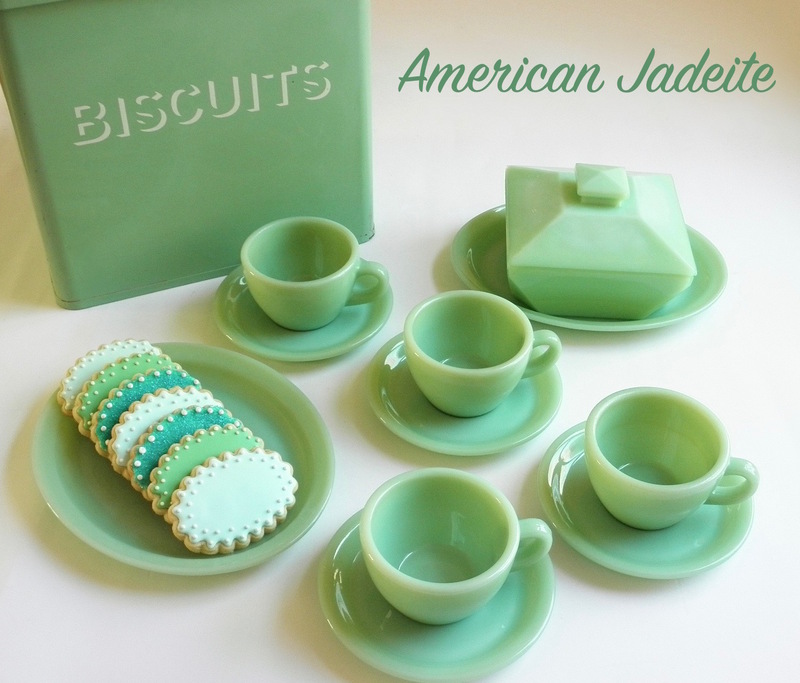 To add color, dab a toothpick into concentrated paste food coloring, dip into icing, and stir. Repeat, using clean toothpicks until the desired color is achieved. To use a small tip, fit the coupler into a clean icing bag. Snip off enough bag so that the coupler's grooves are visible. Place tip on the coupler and screw on outer ring. To switch tips midstream, unscrew the outer ring. For a large tip, simply snip off enough bag until the tip fits snugly (you can't use the coupler). Note that once a bag has been cut to fit an oversized tip, it can no longer be used with the small tips. With a spatula, fill bag half full of icing. Twist the top of bag closed and, holding the bag with thumb and forefinger and resting it on the hell of your hand, apply pressure near the tip so that icing squeezes out smoothly through the tip. Julie may have been first in the cooking; however, to me, Martha was first at the baking! What a lovely post about the Martha by Mail decorating booklet, David. Truly a keepsake for the generations! Nothing makes a cake more spectacular than a simple and elegant decoration using a beautiful buttercream icing! Julia did introduce the masses to fine cooking and recipes, but it was Martha who introduced the masses to a way of life. Baking definitely took a big spotlight in the world of Martha and we're all the better for it! I agree about buttercream and cakes. They're a match made in heaven! I remember when I purchased my cake decorating kit many moons ago.. I loved the booklet. I particularly like the tip and related piping guide. While I learned many basics of cooking and baking from my Mom, it was Martha that truly taught me how to bake and decorate cakes. I'm anxiously awaiting the new cake book, coming next Tuesday! Oh Amy, don't be so hard on yourself. We bakers are always trying to improve on our skills in the kitchen, so you're not alone. I'll go ahead and take a look at the ganache of your cake! 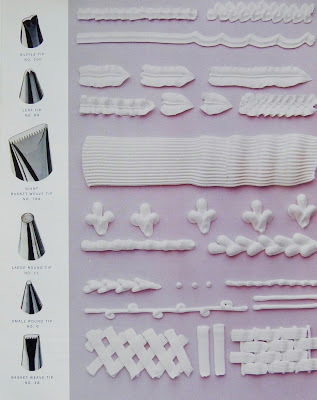 I never did buy the cake decorating kit, even though I wanted it. I suppose I must have had the tools already! As for Martha, I understand how you feel. Martha has taught us SO much that I consider her one of my best teachers ever. The wealth of knowledge is immeasurable! Thanks again for the wonderful booklets. I'm going to dedicate posts to each one. This makes me want to bake a cake right now! Such simple elegance. Mmmm...let's see, does anyone I know have a birthday coming up soon...? If I lived in your area, Nancy, I would bake you a cake for sure! These classic ones from MSL are as nice today as they were when they were first introduced. This is really an awesome stuff I could see here and I admire you for the same. Thanks Natalie! This is really useful information.